StrangeGiving Sale 2010: All Merchandise 50% Off! 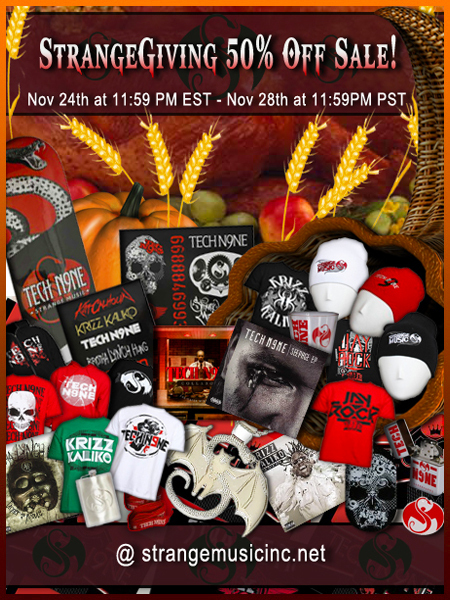 It’s that time once again Strange Music fans – Time to log in and stock up! Forget the other Thanksgiving weekend sales – our annual StrangeGiving 50% off sale starts Wednesday, Nov. 24th at 11:59 PM and runs through Sunday, Nov 28th at 11:59 PM. That’s right: all the Strange Music gear you’ve been wanting is 50% off! So before you fall victim to a turkey coma, get on over to strangemusicinc.net and get 50% off all of your favorite Strange Music merch. Don’t wait because quantities and sizes are limited and once it’s gone, it’s gone!